Outsourcing can be an amazing thing…or it can be a giant headache. If you’re new to outsourcing your tasks, it can be hard to separate the best outsource marketplace websites from those that provide less than reputable services. Choosing an established, reputable, and active marketplace or directory for finding freelancers is the first step to making sure you kick off your outsourcing efforts on the right foot. While there are dozens, if not hundreds of marketplaces to choose from, I generally recommend going with one of the major players. Whether you’re looking for good customer service, money-back guarantees, recommended contractors, or simply a strong technology solution, each of the following companies rose to the top for a reason. Odesk: Odesk was one of the first big players in the outsourcing space, and remains a go-to for many employers and freelancers. Unlike Elance or Guru, Odesk is primarily focused on budget projects, and most of the freelancers on the site are from overseas. Elance: Elance was also one of the early players in the outsource marketplace space. While the freelancers listed on Elance are from around the world, with varied prices and skillsets, many seem to be centered more around US and European workers, with workers that have more formal Western educations, and the prices that reflect that as well. Guru: Guru is a great site for mid and higher range projects. A number of the freelancers are pre-screened and provide ample portfolios demonstrating their work. Guru gears towards the tech savvy crowd, providing a lot of IT, software, web design, and other engineering-minded skillsets. 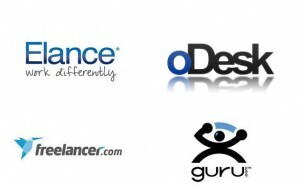 Freelancer: Freelancer is another of the major players. Like Odesk, the focus here is on budget and mid-range projects, which results in a lot of overseas providers. Overall a good solution, but I’m not a fan of the upfront fee structure based around awarding a project. TaskRabbit: TaskRabbit is a little different than the other four providers in this list. The focus here is on tasks that are location-dependent. Because of this, there are many more personal tasks listed than other sites, though of course a full suite of online categories are represented as well. Each of the above sites is a good option for finding freelance work, though (as with any outsourcing) the quality and reliability ultimately depends upon the individual hired. If you’re new to outsourcing, you should read up on the pros and cons of outsourcing jobs and some common outsourcing mistakes before you decide to hire anyone.